and then you go about designing that dream space. This bathroom most definitely did NOT look like this when we started. Not.Even.Close. You might not know but our house was old and abandoned with broken windows and lots of grossness (for lack of a better word). It had never been lived in full time- and was left for vandalism and yuck in the country for YEARS. As in like 60 years. Where who knows WHAT happened. All we know is that when we bought the house- we were pretty alarmed at some of the grunge and damage in all the rooms which leads us to think it may have been a party house or squatter house even at some point during those 60+ years. And this bathroom... well this bathroom was what you might refer to as a diamond in the rough. THAT WAS QUESTIONABLE IF THERE WAS A DIAMOND JUST WAITING INSIDE. Okay- honestly, a diamond in the rough is generous. Remember how I said I see potential to a fault? This house is a perfect example. The Before- was incredibly hard to look past. Short ceilings, old hodgepodge mismatched tile- including my favorite- 'Giraffe Tile' which was a golden yellow with brown spots on the floor, broken shower door, cracked sink, red subway tile on the walls- except for the brown that was on the other wall and then all that water damage and broken tiny window. I actually liked the sink but it was cracked and unusable. (ahem BLEACH) and paint and primer. We took that apart and re-used it in another room. it just didn't fit our idea of what a dream would look like. And I have to tell you... that magic wand? THE best investment we ever made. looked more like, blood, sweat, tears and A LOT of work. the space work for how we live. And when it comes to tackling any kind of renovation or re-decorating project- I always start with what works and what I WANT the space to look like. And with this project- we learned more than a few things. Obviously, unless you are adding square footage or raising the roof, etc. the best thing and easiest thing to do is work with what you have. For this bathroom, the plumbing didn't move. We kept the sink along the same wall as it was originally- where the cupboard was next to the original sink- we added a second set of pipes (my dad is a contractor extraordinaire) for the double sink. The shower is in the same spot, the tub is an addition but it piggybacked off the water heater plumbing and sits in the spot where the water heater used to be. it would have been quite an expensive project that your plumber would love you for- but your wallet? Not so much. So if you can work with existing- go for it. is a small space with a big amount of chaos and patterns. unless you love overload of pattern and color- keeping that simple backdrop is a good choice. I like to keep a cohesive and somewhat simple look. 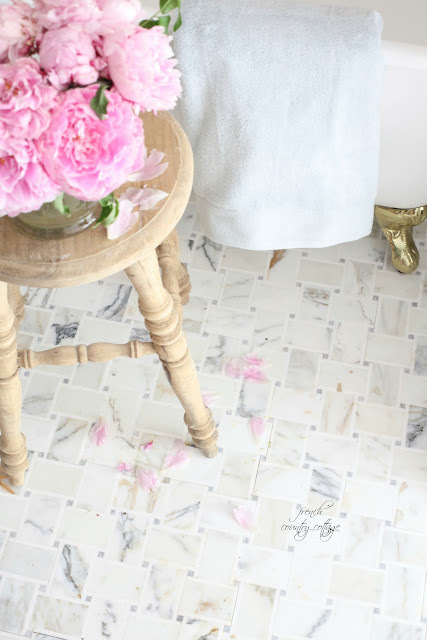 If that is tile, wallpaper, whatever floats your boat- go for it! I had wallpaper in this bathroom for years- I loved it. I paired it with simple white beaded board to keep it from feeling overwhelming. Then you can add in your pops of colors, patterns and details and all your favorite outfits and hats - and then change them whenever you feel like it. Something that was a splurge for me- the vanity and the cast iron tub. I firmly believe that if you cut high end choices in one area - you can splurge in others and have an overall decadent feeling bathroom. The way that splurge worked into the budget is the next tip. IF you area a diy kind of person- and really be honest with yourself there- then you can tackle things like doing the tile and save at ton. HIRE those jobs you are not qualified to do. DIY can go very wrong- and anytime you are working with plumbing, construction and electrical situations- I have my go to phone a friend to come over and help. Plus, if you do it wrong the first time- you will be paying twice as much to have it fixed. Just hire the job out and get it done right the first time and put your mind at ease on if it was done correctly. Some of the BEST items for renovating are things I have found online. 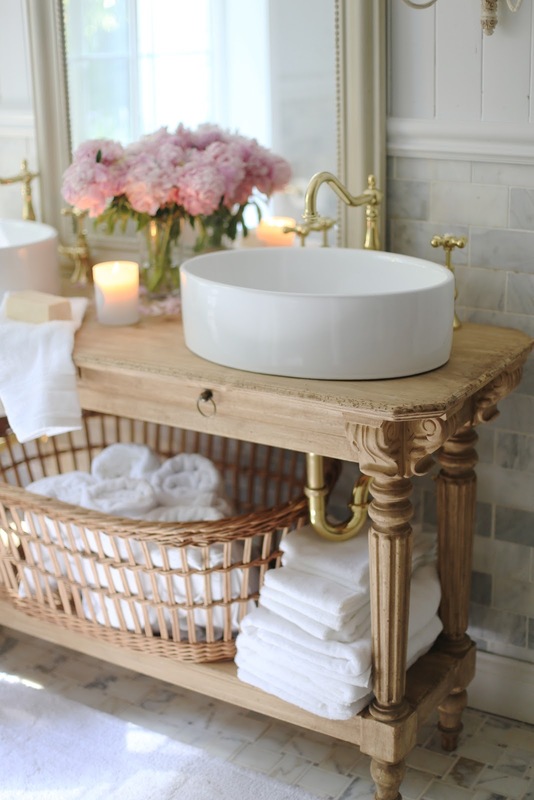 All the faucets, sinks and even that cast iron tub- all sourced online. My local big box home improvement stores did not have them and the finish, style and sizes I was looking for were not easy to come by. A favorite source for vintage style is Signature Hardware - all of those things mentioned above were from them. Shop vintage as well- some of the best items come from the thrift store or flea market- and the price can't be beat. I included several vintage elements in the bathroom to give it that 'old world' feeling. 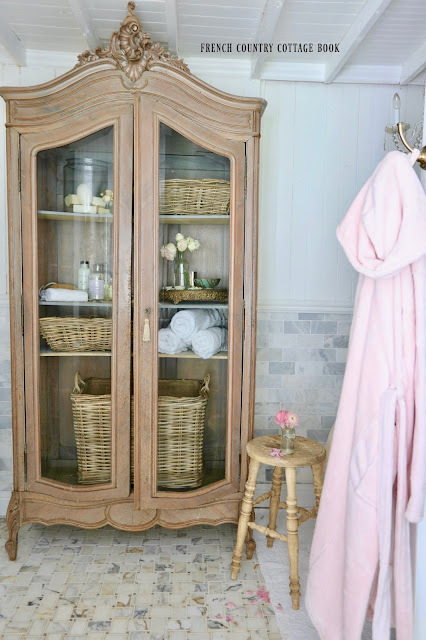 The French armoire is a perfect example. Sourced from Craigslist- I use it to store baskets full of everyday things that I don't want out and about. The laundry basket under the sink is another- perfect for holding rolled towels and extra rolls of tp behind them. It sounds simple- but I can't tell you how many times I bump into a design that LOOKS incredible- but doesn't work. A toilet in an awkward spot even though it adds more floor space or a bathtub in the center of the room even though you bump into it when trying to reach the sink. Remember to think about how you live everyday in that space- and make it work for you. 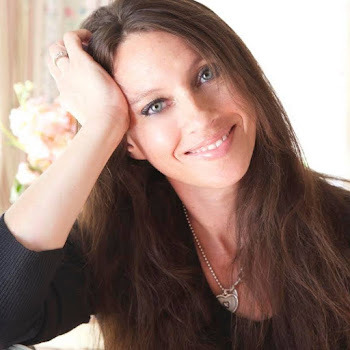 Something I had to learn while living in this house- embrace the quirks. There are a lot of things I don't love about certain rooms, layouts, etc. 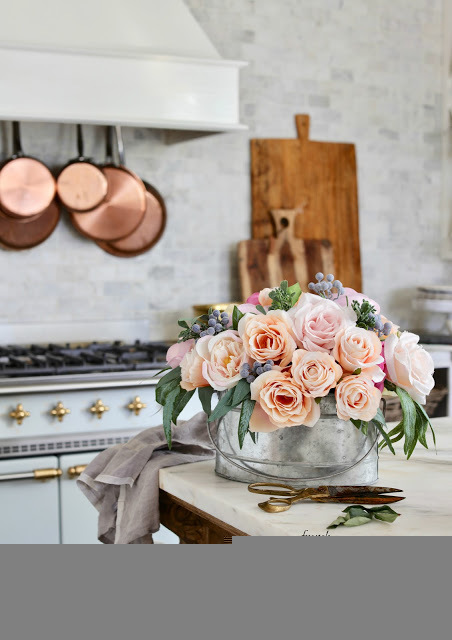 And some of them could be changed if I spent a ton of money and changed entire rooms-but I choose to embrace those quirks and recognize they are part of the character and age of this home- and that not everything has to be changed. That shower? 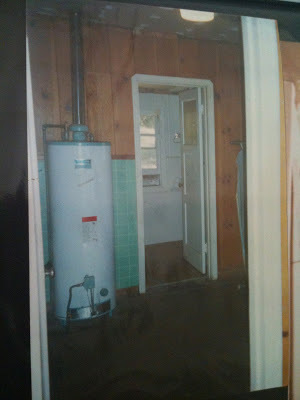 I would have loved to have enlarged it and made it double the size it was- but that would have required moving the toilet and redoing plumbing. And that quirky slanted ceiling above it wouldn't be nearly the same if it was in a different spot. 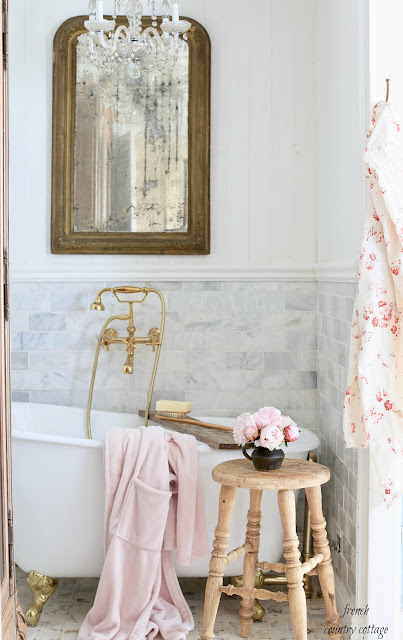 Cozy towels, shades of white, marble on marble, crisp and clean finishes, rich elegant finishes, classic old world style or more modern touches- whatever your dream bathroom looks like- it doesn't have to be expensive, new or renovated to be Love - layer those elements. sightly over the top chandeliers- I am a big believer in the thought that if a room makes you happy when you walk in- that it is perfect. So think about what you love and enjoy the process of creating a space that you love. I hope that helps a bit with how this renovation came about. And something fun- see those sconces? 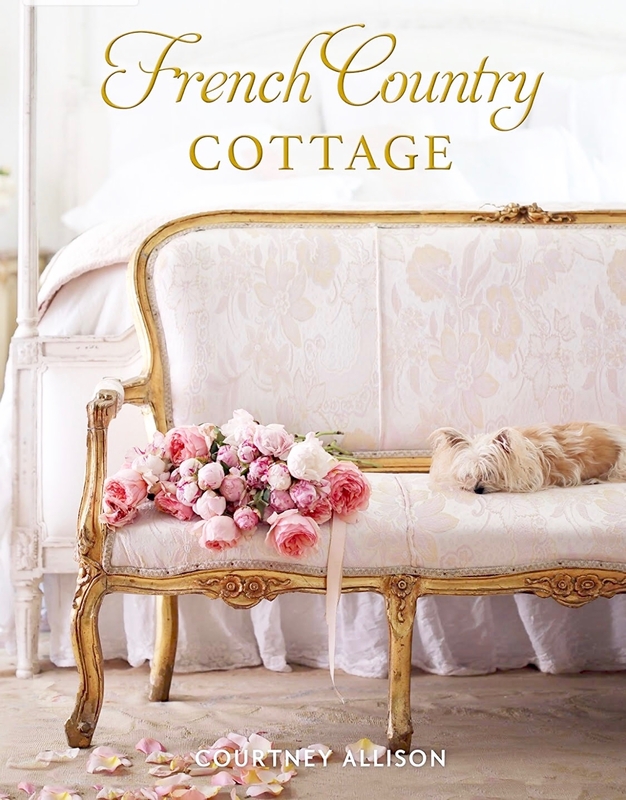 $500 shopping spree to one lucky French Country Cottage reader!! Ahh I hear you on the marble- which goes back to the tip that is about making sure it is functional for you and your lifestyle. :) Sorry about the Instagram only entry- that is the place that Lamps Plus decided on. I do appreciate you stopping by and leaving me a note! Simply gorgeous! We had an old farmhouse (just shy of 100 years old) that we closed escrow on in September 2007 only to lose it in a wildfire in October 2007! I was looking forward to making that farmhouse our own, so it was devastating. On the bright side, we have a brand new (at the time; it's now 10 years old) house with all the modern conveniences and did none of the work ourselves (we didn't DIY a new build). It's beautiful, of course, but it will never have the charm of an old farmhouse or a house like yours. So, I love visiting your site and seeing all your marvelous changes! love it ! what is on your floor and where did you find it, do you like it? Our houses appear to be about the same vintage. 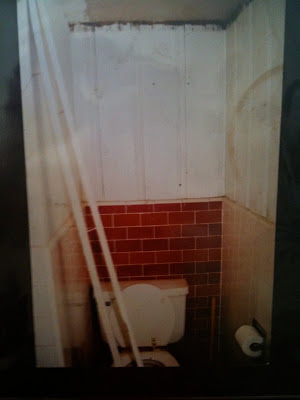 Both the original bathrooms in my home were in a pitiful state upon purchasing the house...as in masking tape holding wall tiles in place. Postage-size footprints. Water damage. Dinky windows. Sigh. Your remodel is lovely! I need to update my bathrooms again and love the inspiration I get with your pictures and stories! I am BUYING your book ASAP. 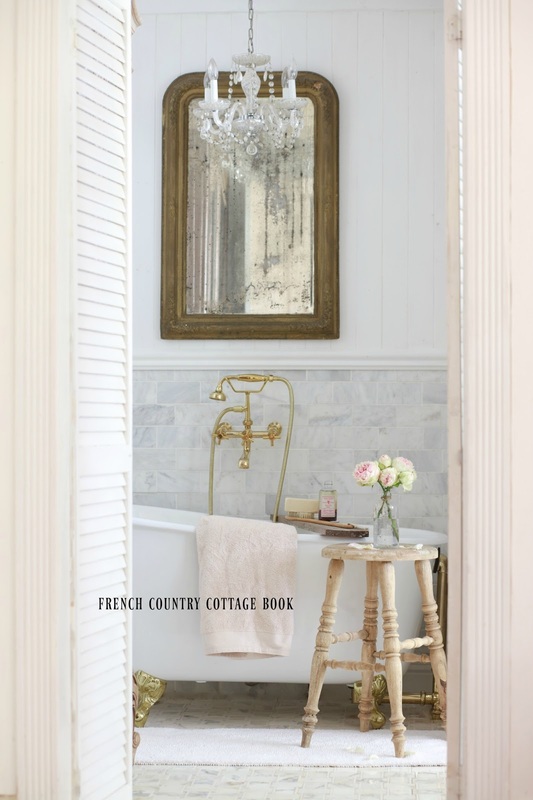 I am searching to make my bedroom Country French style. Would a canopy bed work well? I am a widow and like the feminine touches. PS: If we don’t have Instagram then we cannot enter the giveaway?? I love what you did to that bathroom. I have to say that it is my dream bathroom! Always love seeing the before and afters...just so inspirational!!! Same here, no Instagram but I do love all your tips and your book. Beautiful bathroom. Love your tips. I remember well your hubby talking to me about the progress. I remember when you first looked at it. That was ages ago! and making it nice for your family style! Beautiful bathroom! Courtney, you always have the perfect mirrors. 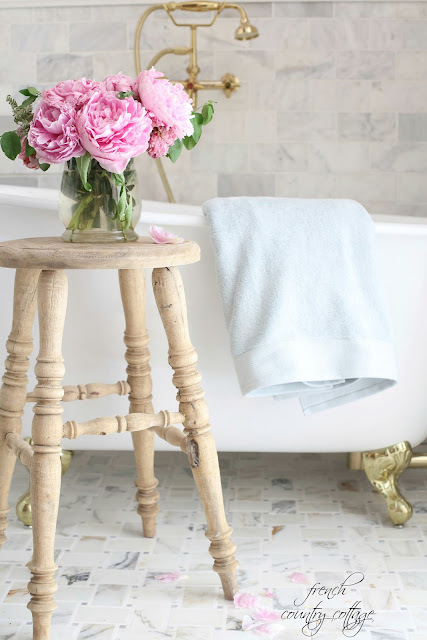 I love what you did with the bathroom, it is good you could look past the grunge. Courtney, as an old home lover, I really loved this post. It was wonderful to hear more about your home's story and see the before photos. Wow! You guys have accomplished so much with this home. It's such an inspiration. I LOVED your tips too. Simply stunning! I love that you work with what you have. Followed the steps. What an amazing giveaway. Thanks for the chance! 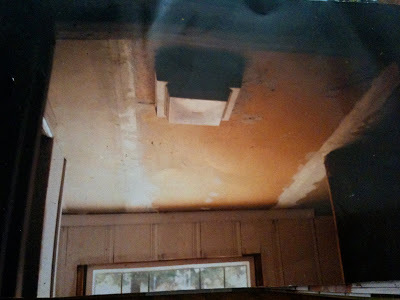 This would be amazing to help with the remodel of our 70's home..
We just demo'd our 100+ year old house bathroom. I've lived with the giraffe-colored tile that had no grout for 15 years! I'm enjoying looking at the studs, currently, dreaming up how I want the space to be. This post was perfect timing! Your bathroom is absolutely beautiful. 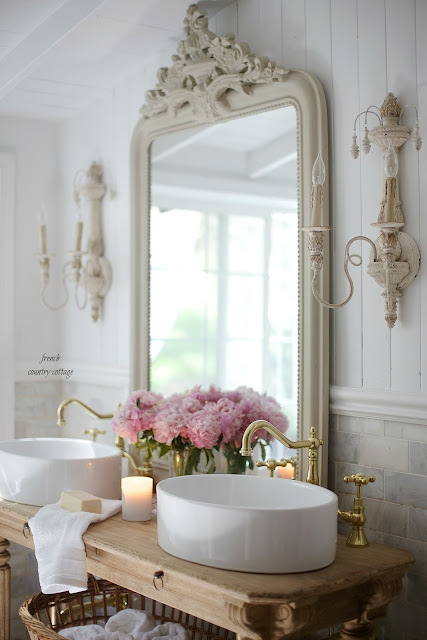 There is so much that I really like about it....the mirror, the armoire, the vanity, but especially the lamps. I assumed you must have found them in antique shop rather than at Lamps Plus. You have done an incredible job. Where did you find your beautiful vanity? no instagram - sorry lamps plus! 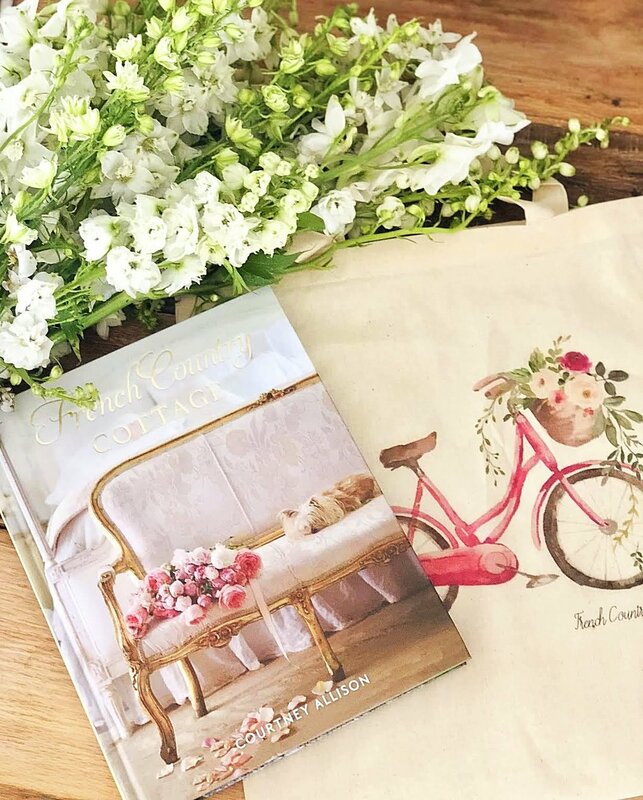 love the pictures of coziness! candlelight is so healing and relaxing. i don't know why i haven't used it much - i'm a widow and i guess there is no point in making a romantic space. until now that is. bedroom and bath are going to get the once over! 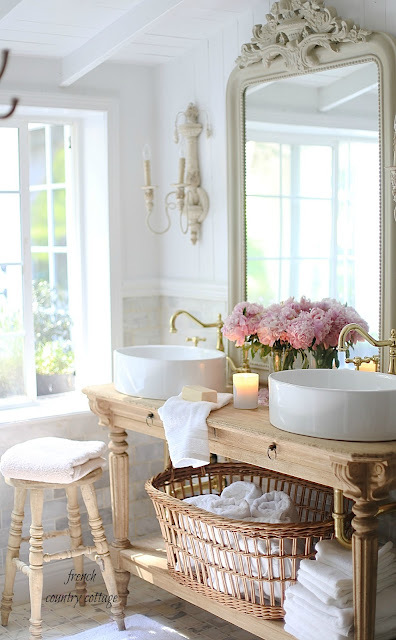 I absolutely love your bath makeover, especially the vanity and sinks, and the mirror is beautiful. I love what you’ve done with it. Was it gold before your makeover? Classy! I sit here drooling with all you've envisioned months before and then made them all come true. I love decorating but it takes a lot of money. Now if I had the money you would be my designer. :) I have a nice little country home and dream big at times. I would love to just sit in a corner of your house and take everything in...sooooo gorgeous. The sink, mirror set-up is outstanding!! TUB...oH my gosh! You are amazing! I'm new to your blog, so I'll be drooling for awhile. So much to view. Your bathroom is beautiful. I'm wondering if you can share where your wooden stool is from. I've been searching for one for ages.